NICOLAS SARKOZY, President of France, said the Assembly’s sixty-fourth session was taking place amid an unprecedented financial and economic crisis, and on the threshold of an environmental disaster. The international community had a responsibility to invest in a new world where the follies of the past were no longer possible and everyone was aware that the path taken over the last few decades was a dead end. The international community was accountable to the tens of millions of people who had lost their jobs, homes and savings; the billion who were suffering from hunger; and the hundreds of millions who had no access to water, energy, health care or education. It was the duty of the Heads of States to restore hope to these human beings, he said. The question was whether the world would change because it acted together with wisdom and intelligence, or waited until change was thrust upon them by fresh crises. On the issue of reform, he said the number of permanent and non-permanent members of the Security Council needed to be increased. It was unacceptable that Africa did not have a permanent Council member. It was equally unacceptable that South America, with such a great Power as Brazil, or India, with its population of 1 billion, or Japan or Germany, be excluded from the Security Council. The legitimacy of the United Nations depended on such reform. The international community needed to reform the International Monetary Fund and the World Bank, he continued. Voting rights in those institutions needed to be more equitably distributed among countries and their missions redefined. There could not be a multi-polar world and a single currency, he declared. The system had to be reviewed. Tax havens had to be eliminated and the price swings of commodities that were subject to excessive speculation, starting with oil, had to be curbed. On climate change, he said that, in Copenhagen, the international community needed to establish quantitative targets for greenhouse gas emissions and set up a world environment organization. The world could not let the law of trade be the only law. 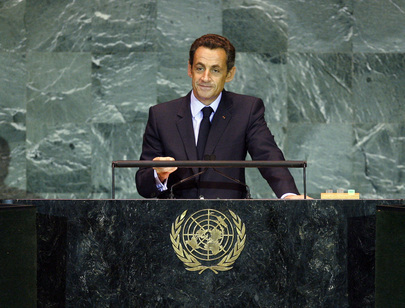 While believing in free trade, President Sarkozy said there were specialized United Nations organizations that set fundamental standards in areas such as health, labour and the environment. No single standard was more important than another. The world needed to develop further resources for development assistance. These resources could be developed by taxing excessive speculative gains, if necessary. He appealed to all countries to have the recommendations made by the Commission of Experts of the President of the General Assembly on reforms of the international monetary and financial systems, chaired by Joseph Stiglitz, implemented as soon as possible. The task before the world was a huge one. In Pittsburgh at the upcoming G‑20 meeting, and in Copenhagen, nothing would be worse than a mediocre compromise. France had come to say the world had no more time to act. He hoped that 2009 would be a year in which a more fair and efficient world order would be established.